Ive had a little rush for Family Photoshoot Voucher’s this month. It makes my heart sing for two reasons. The first being someone is trusting me with capturing their family memories, which makes me do a little jig. The second because choosing experiences for a Christmas gift is very close to my heart. So when someone decides to choose a Family Photoshoot Voucher as a gift, then they choose me. I did a blog recently about what we as a family have been doing over the past 3 years. Now granted that was motivated to help curb the materialistic growth of Christmas. However eventhough the intention was different the results are the same. Christmas morning the last 3 years has been a delight. Clearing up after the bombshell of Christmas morning has been even better. We can find ‘homes’ for all the new toys in 20 minutes. Previous to that i was putting Christmas toys away weeks after the event. So if you are stuck for Christmas Gift Ideas then pop over to my Blog and have a read. I have listed lots of experiences we as the Hudsons have been doing. With great success!! Or if you are thinking of a Christmas gift idea for her indoors then choose ME! I guarantee your better half will appreciate that so much more than another candle or scarf. Beautiful memories of your little family. My best Christmas gift from Mr B was a photograph of my kids 4 cuddly toys all lined up. He had gotten it framed and when i see each of those little well loved toys, they represent each little person. Frozen for that moment in time. I cried all morning each time i looked at it. So do something different this year and go with a family photoshoot voucher with yours truly. Each of my lovely little certificates are different, just like my family photoshoots. They are unique to your family, just as your memories are. 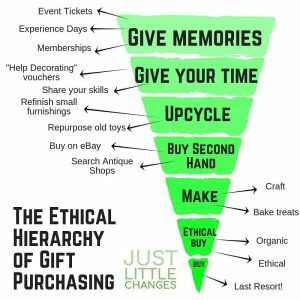 So as you may or may not have been aware in the press recently there is a huge push to go green with your Christmas Gift giving. Landfills are already exploding with the plastic fantastical and the disposable goods we use as a society. I came across this little post a few weeks ago and it really made sense. Now I appreciate as you go up the hierarchy it can become more expensive, but only if you let it. We need to teach our little humans its all about the thought not the monetary value. How do we do that, well ive been told they watch everything we do. So if they see us making better choices at Christmas hopefully it will filter. So not only choosing a family photoshoot voucher with me is fun and wonderful. Its also pretty high up on the ethical hierarchy of gift purchasing. Thats two wins !! Have a wee nosey at some of the family photoshoots ive done recently and see if they tickle your fancy. Click HERE to see previous family photoshoots. Okay thats my lecture over. If you want to book a Family Photoshoot Voucher with me for a lovely Christmas Gift, please click HERE and send me a wee email. The photoshoot vouchers are lovely and you can choose your value.